Well that didn't take long for Jesse Singal to keep this going. I'm beginning to think that Singal is not only a really bad excuse for a journalist but a raging narcissist. Which would explain why so many hits on his name are people writing about him, rather than the other way around. 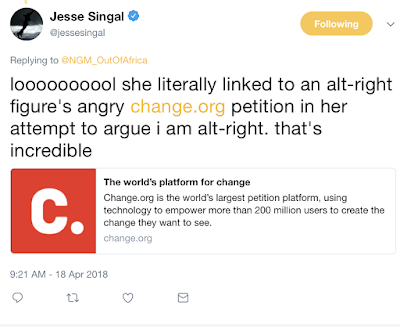 Anybody with a basic comprehension of the English language would understand that the reason I posted the link to the Change.org petition had nothing to do with any claims about Singal being alt-right. I never even used the term alt-right in the blog post. 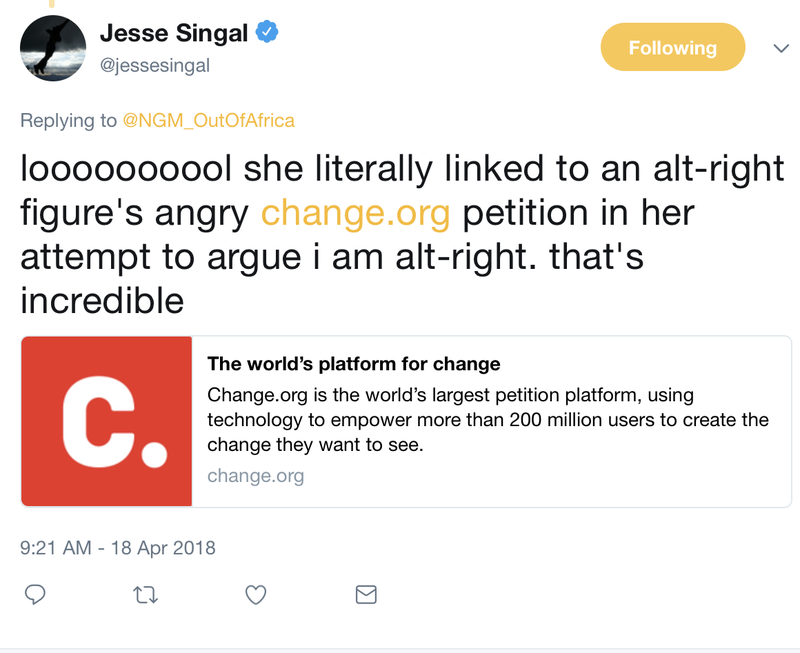 How is it possible that Jesse Singal can be a journalist while having a reading comprehension issue? Even when they vaguely puzzle out this point, Pinker supporters don’t understand it. What does Jesse Singal say in the New York Times? The clip was deeply misleading. If you watch the whole eight-minute video from which it was culled, it’s clear that Mr. Pinker’s entire point is that the alt-right’s beliefs are false and illogical — but that the left needs to do a better job fighting against them. No. He clearly says that the alt-right’s beliefs are the fault of the “PC” Left, which says nothing about making better arguments to oppose them, and is a falsehood. His talk was about doling out the blame to the Left, not about fighting the alt-right. If you listen to the whole 8-minute video, what you hear is Pinker first saying that you can’t voice certain facts on campus, then stating those facts (self-refutation, anyone? ), then explaining that his facts are more complex than he let on, which is what the college professors he’s blaming already do. But then this kind of disingenuous denial of reality, of focusing superficially on he said/she said note-taking, is exactly what the New York Times specializes in. I said this at the time and today's exchange has only confirmed it: Jesse Singal is a lazy sloppy journalist and that trait is just as apparent in his tweets.